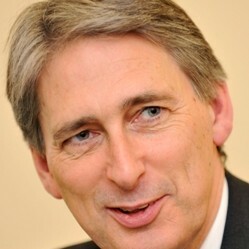 Philip Hammond PC is a British Conservative politician who has been the Secretary of State for Foreign and Commonwealth Affairs since 15 July 2014. Hammond first entered Parliament following his election in 1997 as Member of Parliament for Runnymede and Weybridge. He was promoted to the Shadow Cabinet by David Cameron in 2005 as Shadow Secretary of State for Work and Pensions, remaining in this position until a 2007 reshuffle, when he became Shadow Chief Secretary to the Treasury. After the formation of the Coalition Government in May 2010, he was appointed Secretary of State for Transport and was sworn of the Privy Council. Upon the resignation of Liam Fox over a scandal in October 2011, Hammond was promoted to Secretary of State for Defence and, in July 2014, he became Secretary of State for Foreign and Commonwealth Affairs.